The PIXMA MG8120 possesses superior quality, functionality and versatility combined with beautiful design. The amazing feature set begins with an all-new interface that turns the top of your printer into a sleek, ultra-responsive touch panel. The Intelligent Touch System provides light-guided direction with gorgeous touch sensitive controls so only the buttons you need light up. Your fingers will realize fluid, effortless operation where once you choose your function you're one step away from imaging brilliance. For the first time in home photo printing you can print still photographs from your captured HD movies with your new PIXMA printer. 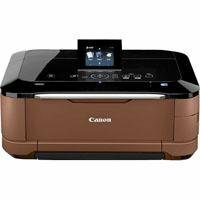 Full HD Movie Print turns your favorite HD movie clips captured with compatible Canon EOS Digital SLR or PowerShot cameras into beautiful photo prints. Built-in Wi-Fi lets you easily print and scan wirelessly with the added ability to print your photos from compatible iPhone, iPod touch and Android devices. Produce true photo lab quality prints at home with a maximum print resolution of 9600 x 2400 dpi and six individual ink tanks including a gray ink for professional color and black& white photos. Its superior 9600dpi high-resolution CCD scanner includes a Film Adapter Unit to easily scan 35mm film and slides. Plus, the White LED eliminates warm-up time for document and photo scanning while Auto Document Fix delivers beautiful, easy-to-view scans by advanced image analysis and area-by-area data correction, automatically.